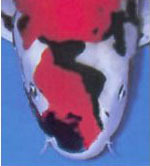 Showa Sanshoku has white and red patterns on a black base. It is similar to Taisho Sanke, but with more larger black markings (including on the head, pectoral fins and abdomen). The old-style showa contains more black and very little white. In the modern-style showa, called Kindai, the colors are more balanced, sometimes being difficult to distinguish it from the Sanke, the difference being that while a Kindai Showa will have “bands” of black around the body, Sanke can only have sumi spots above the lateral line. It is desirable for a Showa to have all three colors on their face. Hi Showa: Predominantly red. The Hi pattern runs from head to tail. Kindai Showa: Predominantly white. New-style showa with more than 40% white. Old-Style Showa: with more black and very little white. Tancho: with a roundish red marking on the head between the eyes (with no other red on the body). Boke: The sumi is blurred, more gray than black in appearance. 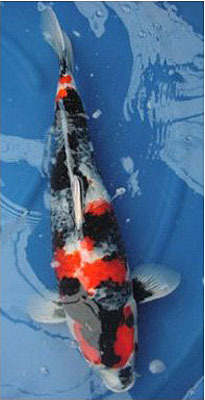 Showa Sanke, aka Showa Sanshoku, Black bodied koi principally red (Hi), and white markings. 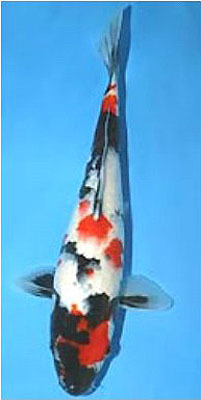 Similar to Taisho Sanke, but with more black markings, including on the head and margins of the pectoral and tail fins. Red (Hi) should be blood/dark red, black (Sumi) like darkest night. Some black on fins allowed, a lot undesirable as is any red. Hi Showa: "Heavy Red" pattern like meandering islands of red that are interconnected. Kindai Showa: More white pattern with meandering islands of red that are not interconnected. 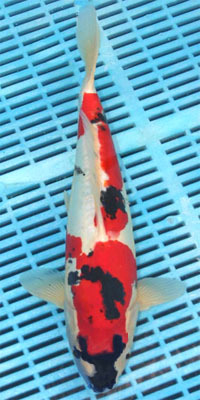 Koi with basically large black patterns plus some red and white ones are called "Showa Sanshoku". The main differences between the Taisho Sanshoku and the Showa Sanshoku are: The Sanke have red and small black patterns on a white base, whereas the Showa have red and white patterns combined with large black areas. Another easier distinction are the head colour patterns. The Sanke have no Sumi on the head, while the Showa have an oblique line ("menware") or Y-shaped mark and/or nose Sumi. Many of the modern Showa Sanshoku have only a characteristic Y shaped mark. The appearance of the Sumi is different. Whereas the Sanke markings are roundish and tend to be found mainly above the lateral line, Showa's have large, deep wrapping shapes many times extending down over the abdomen. The pectoral fins of the Sanke have either Sumi stripes or none, while those of the Showa have "Motoguro" ( black joint spots ). The ideal pattern of Sumi is a lightning shaped head Sumi which divides the head, Motoguro, and imposing Sumi markings on the back. As for the pattern of the Hi that is highly praised in the Kohaku, it is also preferred in the Showa. A large head Hi is required. It may spread over the nose, cheeks, and jaws. Deep, uniform Hi is desirable. Clear edges of the Hi are preferred. White patterns are a very important factor for a fine Showa, the percentage of white should be about 20% to 30% of the body. The white should be pure white. A white area about midway along the back enhances the beauty of the koi. When white surrounds a Sumi mark on the back, it makes the koi look elegant. White cheeks make a koi charming, while a white mark on the tail region gives it a decent look. One characteristic head Sumi obliquely crosses the head Hi, while another is Y shaped, balanced by nose Sumi. In all cases the head needs Sumi on it. Ideal body Sumi are lightning or mountain shaped, the latter spreading down to the abdomen. Large Sumi markings are preferred, if they produce asymmetrical patterns. The pectoral fins should have Motoguro, however some Showa do not have them. All fins should be free of Hi. Popular today are the "Kindai Showa" (Modern). This type of Showa is predominantly white which gives it a bright overall impression, and at first glance looks like a Sanke. Showa or “Showa Sanshoku” is a Kohaku with an added black, spreading pattern overlaid onto the body that wraps from the back down below the lateral line. The black is not spots like in Sanke. Showa were first stabilized round 1920(the Showa Emperor era). 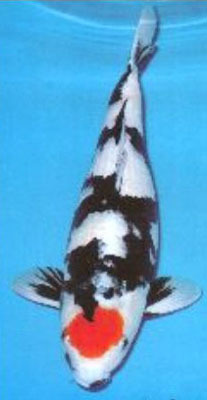 The earlier Showa bloodlines were a checkerboard of black and red with very little white showing making people call it a black koi with white markings. In fact, breeders kept only all black babies. 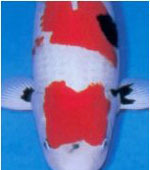 Modern “Kindai” bloodlines have a more balanced amount of white, red and black showing. Not until the creation of the modern Kindai Showa did Showa compete on an equal basis with Sanke and Kohaku. All of the criteria for Kohaku also apply to Showa. In addition, the black wrapping pattern must add to the overall balance of the pattern. The black or “sumi” pattern must all be the same color, must be thick with good kiwa, may have sashi and must be shiny black. Early bloodlines had dull or matte finished sumi and were not as popular as the modern Showa. Showa MUST have all three colors on their face. Often there is a lightning pattern across the head down to the nose called “Menware” or a V pattern on the shoulder. Showa usually have black in their fins including black base of the pectoral fins called “motogoro”. Showa have a tendency to get too much sumi on the pectoral fins or on the back half of the koi making it appear tail heavy. It is difficult to finish the quality of the hi and the sumi on a Showa at the same time because the hi peaks early in age and the sumi peaks later. Many Showa have lost to Kohaku because the sumi on the Showa was not finished which detracted from the appreciation of the Showa even if the white and hi of both koi were equal. It seems unfair but on the other hand a Showa with all colors finished has the advantage of difficulty and rarity over Kohaku. Again, this is not often discussed but definitely an advantage in judging. Some Showa have light gray sumi under the surface of the scale called “boke” but many judges call it unfinished if some of the sumi is up and black but not all of it. Local, unfinished sumi marks on Showa are currently being evaluated whether they should be judged a beauty mark if the quality of the koi is high. Should a Showa with some unfinished sumi be less appreciated than another koi variety that is finished? It is not a simple answer because you have to see both koi to make that holistic judgment. However, these judgments have been questioned in the past. Showas with underlying sumi that forms a reticulated pattern like Goromo are called Kage Showa and are put into Kawarimono class. Go figure.